In the face of adversity, particularly of a criminal breaking in and attempting to hurt your loved ones, a biometric gun safe can be one of your allies in repelling an attack. With a biometric gun safe, you can quickly access your weapons and defend your family. The best biometric gun safe is not only great at enabling you to get your firearms in the fastest way possible. It can also keep your weapons away from your children. More than 200 children were involved in accidental shootings in the US last year, and you certainly don’t want your children to be part of the statistics in the near future. 4 What Is Biometric Gun Safe? 5 What Are The Types Of Biometric Guns? 6 How Do Biometric Gun Safes Work? 7 How Safe Are The Biometric Gun Safes? For most gun owners, the main reason they’re getting a biometric gun safe is because they want to open the gun safe as quickly as possible. Unlike key based locking mechanisms where they have to find the key or a code-based locking system wherein they have to input the correct code, a biometric gun safe only requires the user to put his fingers on the scanner. Thus the fingerprint scanner should be reliable all the time. The biometric fingerprint safe is one that can read and store multiple angles of the fingerprints of an authorized user so that the chances of incorrect readings will be minimized. With a fingerprint scanner that can memorize up to 100 fingerprints, for instance, you’ll have peace of mind knowing that your fingerprints will be read by the scanner at any given time, especially during an emergency. Moreover, having a large memory also means that the fingerprint gun safe can have multiple authorized users. You can let your spouse, brother-in-law, or other trusted adults in the household to access your weapons in time of an emergency. Just like in buying any other gun safe, you will have to consider the number and the sizes of your guns in choosing a biometric gun safe. Measure your weapons and take a look at the interior dimensions of the biometric gun safe that you are considering, so you will know if your firearms will fit inside the gun safe. You should not only consider the number of weapons you have right now, but the prospects of you getting another pistol or handgun in the future. Most gun experts suggest getting the biggest gun safe that you can afford, because according to them, gun owners are prone to expanding their collection in 2-3 years. You should look for a biometric gun safe that is made of steel as it is difficult to open for most criminals. The general rule of thumb is that the thicker the steel, the better the gun safe. Also, you must look for models which have their doors and hinges fitting tightly because these would be hard for burglars to open using a crowbar. Biometric gun safes that can be mounted on the floor or the wall are also ideal because criminals won’t be able to steal the. Fingerprint handgun safe is a must-have for anyone who values the safety of not only their gun but also the unauthorized people like kids who might access the gun. Choosing a suitable gun safe can be a little tricky, but it is totally worth it to sample a few top gun safes that will perform its function efficiently. You do not want to buy a biometric gun safe that will be a disappointment to you. I will review eight of the top biometric fingerprint so as to give you an easier time to settle on the most suitable gun safe for yourself. Follow the following biometric top pistol safes review and get your gun a secure safe. This is a solid choice for a biometric gun safe. It gives you two options to open the safe—through a fingerprint scan or by inputting a code. With two options offered in opening this safe, you will have more peace of mind knowing that you can access your weapons when it counts. You can enroll up to four fingers in this gun safe. Sure, it doesn’t have the biggest memory for a biometric gun safe. However, it guarantees you that you and perhaps your partner are the only ones allowed to access the belongings inside the safe. In terms of reliability, the scanner is pretty reliable. I liked the scanner requires them to capture their fingerprints from all angles so that the chances of fingerprint reading failures are greatly reduced. The fingerprint scanner works quietly, which is very critical during emergencies as you don’t want the intruder to hear that you are opening a gun safe. There’ s copper stripper located underneath the area where you are to place your finger. It can detect your body’s warmth so it can initiate the fingerprint scanning. It is an impressive feature that reduces the time to open the gun safe, allowing you to grab your pistol and defend your home quickly. The safe works with four AAA batteries, although these are not included in the package. There will be flashing LED lights that would tell you it is time to replace the batteries. In terms of security, this biometric gun safe is made of 12 gauge stainless steel. It can withstand blows from an axe. Burglars won’t easily open this gun safe with its lip that overhangs the bottom section. Aside from its pry-resistant top lid, there are pre-drilled holes at the bottom of the unit so you can mount it to the base of the floor. You can also easily move this unit around as it only weighs 13 pounds. The biometric gun safe is backed by a one-year manufacturer’s warranty. This Barska biometric safe may be the best gun safe for the money. It has a fingerprint scanner that can allow use of up to 30 authorized persons, and it has pre-drilled holes that make it easy to be mounted into the floor or shelf. With its top-opening design, this safe is ideal for concealing inside a desk or filing cabinet drawer. The scanner is capable of recording 30 fingerprints. You’ll have to place your entire finger in the scanner so that the system will read it. It doesn’t use the more reliable finger swipe method, but it is still pretty reliable. With the system capable of reading and storing 30 fingerprints, it would let you have more authorized users access your firearm during an emergency. The biometric scanner itself is reliable that many Amazon.com reviewers say it rarely failed to read their fingerprints. In a case of the scanner malfunctioning or the battery running out of power, you can still open the safe with the two emergency backup keys included. Just make sure that you keep the keys in a secure location so that these don’t end up in the hands of the wrong people. The four AA batteries should last for one to two years, depending on how you frequently open the gun safe. There are also strong locking bolts in this safe, further making it secure and difficult to open. The strong locking bolts are hard to bend out of position, so burglars will have to be extra patient, resourceful and strong if they want to get your weapons. The space inside the safe is designed to hold a couple of handguns and extra magazines. Sure, it is not spacious, but there’s a protective floor mat that can keep your precious handguns free from scratches and dust. Moreover, you can also store small valuables inside this safe like passport and cash. Barska gives you a one-year warranty on this gun safe. This is one of the lightest biometric gun safes that you can find on the market today. At just 8 pounds, you can easily place this inside your vehicle. It can also function as a home drawer safe. The MVB1000 has a high fingerprint capacity scanner, capable of reading and storing up 120 scans of fingerprints. It is easy to use as well as you simply have to swipe your finger across the scanner. The gun safe makes use of a high-performance algorithm that translates to quick identification of enrolled fingerprints. Its computer can also block access after multiple successive attempts. Thus the unauthorized users won’t stand a chance of opening this safe. In the unlikely event that the scanner malfunctions or its battery gets drained, you can still open the safe through a backup key. The space isn’t top notch, but you can’t really look for a safe that can hold multiple guns and expect it to be lightweight and handy. You can probably put two small handguns inside this gun safe. If you only have one gun, then you can also store other valuables like jewelry and cash inside the safe. There’s protective foam inside to keep your essentials free from scratches. There’s no chance that burglars will be able to open this safe unless they’re as strong as the Hulk. It is made of 18 gauge steel and has a rock solid construction. It is also impossible to pry it open with a crowbar and other hand tools. The manufacturer even throws in a security cable in this product which would let you to secure it under your car seat. Thus even if burglars are successful in opening your car, they won’t be able to steal the safe that easily. This safe comes with a long five-year warranty. This is another compact gun safe that you can store in drawers, cabinets, and even under your car seat. It is sturdy and strong enough to deter criminals, and ideal for keeping your kids away from your weapons. Included in the package are two emergency backup keys, a mounting kit, Inner floor mat, a set of four AA batteries, and the safe itself. The safe can remember up to 30 fingerprints. In order to open the safe, you will have to place your finger on the pad. Many Amazon.com reviewers say that the pad can remember their fingers well. There’s also an audible beep that would tell you that the biometric scan has recognized your fingerprint. But for emergencies, you don’t want that beep to be audible because it would let your opponent know that you are accessing a safe. Fortunately, you can disable that beep if you don’t want it to be heard by anyone. In the event that the batteries become dead, you can turn to the emergency backup keys of the unit. This won’t really drain batteries that fast as it would take around 2 years for it to need a fresh set of batteries. The safe opens to the front, and you can fit it against a wall or directly on the floor as there are mounting bolts included in the package. It isn’t really lightweight at 31 pounds, but you can still be able to move it around, in case you decide to install it in another area. It may be a bit big to fit under the car seat but it fits well under the seats of a truck or RV. The gun safe is made of a 16 gauge steel housing. It is thick and thus, should be able to resist break-in attempts even of the most determined burglar. Yet despite the thick metal frame, the gun safe manages to remain lightweight at 9.6 pounds. The fingerprint gun safe can only store up to 15 fingerprints, but that should be enough for you to store all your fingerprints in one hand and perhaps the fingerprints of your partner. The scanner is advanced as it will block too many invalid attempts, with a LED flashing light indicating this. In this case, you can turn to the backup override keys to open the safe. The override keys are particularly useful when you have children who may try to gain access by repeatedly scanning their fingerprints. You just have to store the backup keys in a safe place if you don’t want them to find those things. Once you open the door, there’s a blue LED light that illuminates the inside of the safe. This lets you see the interior and allow you to get the right handgun, accessory, or whatever you need that’s stored inside. The LED light isn’t that attention grabbing which is good because you don’t want to let intruders know that you are up to something. There is also a spring loaded door mechanism that makes it a lot easier to open the door. Unlike other biometric gun safes, this one is powered by a battery and electricity. You can plug this in a wall outlet. So in case the battery suddenly becomes dead, or the electricity is cut, the other power source kicks in and you will still be able to access your gun during an emergency. Battery life should last 1-2 years, although this would really depend on how frequent you access your guns inside the safe. Obviously, the more frequent you open the safe, the quicker the battery becomes drained. Don’t worry as there is a LED light to warn you about replacing the batteries. You can place one to two handguns in this gun safe. It’s really more for the gun owner who wants to keep himself protected anywhere he may be. The outer body of this gun safe is made of steel, it is therefore very strong. It is pry and scratch resistant making it durable. It has a locking system of 500 DPI optical sensor and a deadbolt locking system. Besides the fingerprints, You can lock it with a pin number of four to eight digits or a key. It has a non-volatile memory, which means it can store information even if the battery is removed. The memory capacity can take up to 32 different fingerprints and a maximum of one pin number. On the inside, it has one shelf and LED lights. The LED lights operate independently with the help of 2 AA batteries. This becomes more efficient if the gun safe is open in areas with low light intensity. The inside is covered with a fluffy carpet. This prevents your gun from scratching and keeps it in place. For its dimensions, it height measures 10 inches, a length of 14 inches and a breadth of 10 inches. It weighs 27 lbs. The body thickness is 2 mm and the doors thickness is 5 mm. In case an attempt to open it fails due to wrong pin or fingerprints used, it will give you a few multiple chances to retry, after which you will have to wait for two minutes before re-attempting to open it. Using keys and numbers to lock your safe can be limiting especially if you forget the pin or lose the key. The Verifi biometric safe gives you the opportunity to forget about all these so you just need your fingers to open it. It only uses the fingerprints to open it, making it even more secure. You do not have to worry about someone accessing your gun with a key or pin number. The fingerprint sensors are FBI certified and has 3D imaging for the fingerprints. It can store up to 40 coded fingerprints. You can add and delete the fingerprints anytime. In case of unauthorized attempts to access it, you will be notified the exact time the attempt took place. This can help you identify the intruder. You just have to put your finger on the fingerprint sensor of the verifi smart safe first accessible biometric safe. It takes a very short time to recognize the fingerprint and open is 40. The gun safe comes with a tutorial on how to utilize it. The gun safe can work for several years with 4 AA batteries. The inside has a light that illuminates it in case the gun safe is opened in areas with low light intensity. 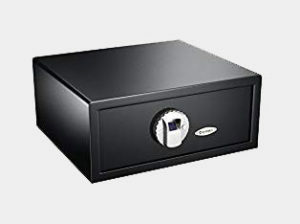 The safes body is made of strong solid steel that guarantees you with durability. The dimensions of the safe are 17.4 inches by 16.1 inches by 7.9 inches. The doors thickness is 4mm whereas the other parts of the walls are 2mm. Safe because it can only be accessed by fingerprints that are coded and registered to it. A gun is a very important tool that will save you big when you are invaded at home. Now that you want to protect yourself, how do you keep your gun? You need to keep it in a safe place where unauthorized people cannot access it as well access it easily when need be. With The Gunbox safe Biometric Handgun safe, keeping your gun in a secure manner is guaranteed. The safe has the following features and benefits. This biometric gun safe uses either a wristband (that comes with the safe) or registered fingerprints to open it. 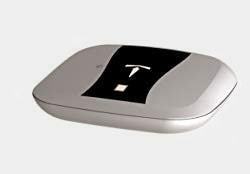 The fingerprint scanner is a 360-degree scanner powered by RFID. Another great thing about the scanner is that it can hold multiple fingerprints. You and any other trusted member of the family can easily access the safe. It has an internal vibration sensor that emits a loud alarm in case an intruder attempts to open it or move it. You get the alert and take the necessary steps when an unauthorized person tries to open the safe. 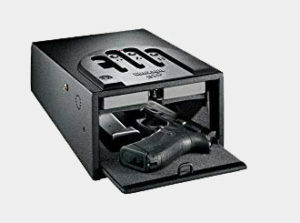 The interior of this biometric gun safe is lined with neoprene which keeps your gun in position and prevents scratching that comes with direct contact of metal to metal. 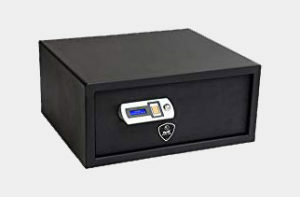 The biometric gun safe’s body is made of strong aluminum alloy. It weighs 7.2 pounds. It measures 15.9 inches by 13.6 inches by 3.6 inches. The gun safe is silver in color. 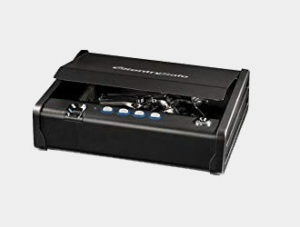 You require 1 lithium-ion battery for the functioning of this biometric gun safe. The gun safe does not come with the battery. Biometric gun safe use registered and coded biological traits and information to keep your guns and pistols safe. The fingerprints are the trait that is commonly used because everyone has different fingerprint. This makes access difficult for people whose fingerprints are not registered with the safe. It allows you to keep your guns and pistols safely, out of reach from unauthorized people. The biometric gun safes utilize the fingerprints registered to open it, a pin code, a key or a wrist band. Some biometric gun safes can be opened by up to forty different registered fingerprints. Gun safes are used to protect your gun from theft, humidity, accidental shooting and other issues that might hinder your gun’s operation. It is supposed to make your gun inaccessible to unauthorized users but accessible to authorized users in case of an emergency. What Are The Types Of Biometric Guns? A biometric gun safe allows you to open or access your gun safe either with a physical key, wristband or manual opening or the fingerprint technology. Some gun boxes have a screw that can be open to access the gun if the fingerprint fails, or if the batteries die, you could manually access the gun by opening the screws. The biometric gun safe only,These kinds of biometric gun safe do not allow any other form of access. It is either you use registered fingerprints; you do not access the gun safe. 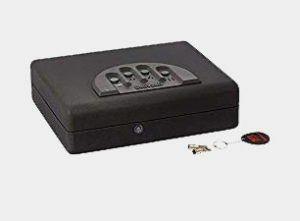 Pin and biometric gun safe,These kinds of gun safes allow you to use either a pin number you set or your fingerprints. You will just have to remove the factory default settings of 1234 and put your own pin. Despite the different designs that the biometric guns safe come in, their functioning is basically the same. After acquiring your biometric gun safe, you will have to enroll your fingerprints and other basic traits and features are captured. After the enrolment of your traits, the traits are recorded and transmitted to codes and graphics systems that are stored in the biometric gun safe’s system. You can now store your gun safely. In case of any attempt to access your gun, the biometric gun safe will make comparisons with the coded fingerprints stored in the system. It would, therefore, allow access if the fingerprints are the same, or reject access if the coded information does not match. Taking care of your gun safe is very important for it to efficiently. If your biometric gun safe is taken good care of, it will definitely take good care of your gun. Follow the tips below to realize the best from your biometric gun safe. It is advisable to frequently wipe the fingerprint scanner of your biometric gun safe. This will ensure you biometric gun safe is protected and no one else apart from you accesses it. You should occasionally open your biometric gun safe then clean and expose your gun and other contents of your gun safe. Check the battery. In case the battery indicates that it is low, replace it immediately to ensure continued and more efficient use. To keep your gun safe clean, regularly wipe it especially if you store it in an enclosed area. Do not clean your biometric gun safe with detergents especially the fingerprint scanner. If it has a lot of dirt, just wipe it with a damp piece of cloth. How Safe Are The Biometric Gun Safes? I would say biometric gun safes are very secure. Despite a few instances of unregistered fingerprints opening some of the biometric gun safes, their accuracy in keeping your gun secure from intruders and other natural hazards is very high. The safety of the biometric gun safe you choose depends on the accuracy of the fingerprint scanner. Some fingerprint scanners occasionally open to unregistered fingerprints. That could be very unsafe to you gun to people around you. For this reason, it is advisable to sample and choose a gun with a more accurate fingerprint scanner. In case of an emergency, the gun safe could be accessed with opening alternatives like a pin number, a key or a wristband. In as much as this may allow, quick access, it is extremely dangerous because someone could access your key anytime, or even guess a four-digit pin. But these alternatives do not apply to all gun safes, some are accessible only by registered fingerprints, no doubt, such gun safes are more secure. Apart from guns and pistols, you could also decide to store your important documents or medication in the biometric gun safes. As biometric gun safe reviews have shown, biometric safes offer a lot of advantages over standard gun safes. If you’re still on the fence, here are some reasons that may convince you. Speed: this is the biggest advantage you get, and it’s the most important. Compared to a regular gun safe, the best biometric handgun safe lets you get to your gun or valuables more quickly. If there’s a break in or fire, it’s common for people to panic and have a difficult time remembering the number combination. With a biometric safe, you know exactly what to do. Limit Access: it’s possible for kids to guess the number lock combination, but that’s not possible with a biometric gun safe. This means you can limit the access to those you trust. Heavy Duty Construction: a biometric gun safe is built to withstand prying. Unlike ordinary gun safes, burglars will have a harder time breaking it apart. A biometric pistol safe also comes with a lot of safety features that secure the contents. Most of them for instance, have a tamper alert built in. Biometric gun safes use the latest technology to safeguard your valuables, and they’re also built with heavy duty materials. The high end gun safes are also fire and water resistant. You can add and remove other people on the fingerprint scanner. If you have a biometric gun safe, you’re assured your valuables are always within reach. If there’s an emergency your gun is just a press away. The top biometric gun safe doesn’t need a lot of maintenance. While that’s one of the reasons why they’re attractive, the following tips will help a lot. Always wipe the biometric gun safe’s fingerprint scanner. This is very important to ensure no one is able to use your fingerprint to open the gun safe. Open the gun safe every now and then and remove the contents. Let the interior breathe and clean your gun too. If you have a master lock biometric gun safe, follow the instructions for its use to avoid problems. Keep an eye on the battery and replace it when the power goes down. There is a battery power indicator that lets you know, so replace the battery immediately. If you have to put the gun safe in a concealed area, wipe it with a clean cloth regularly. This will prevent dust and dirt from accumulating. Don’t use cleaning detergents on the biometric safe, especially the scanner. Just wipe it with damp cloth if there’s a lot of dirt. If the gun safe is plugged in, make sure the wiring is secure. Whether you have a biometric gun safe Speedvault or another model, care and maintenance are important. If you take care of your gun safe, it will take care of your gun. There’s not really a lot involved in maintaining a biometric gun safe, and that’s why you should take the time to manage it. The small effort you put make a difference in terms of its longevity. Among the best brands today are Gunvault, Sentry Safe and Barska. 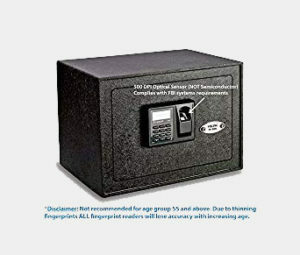 They are reputable companies that make outstanding biometric safes that are dependable and easy to use. Biometric safes work by recording and using your fingerprint to identify the owner. Press your finger on the fingerprint scanner and it opens up without making a sound so you don’t alert the burglars. 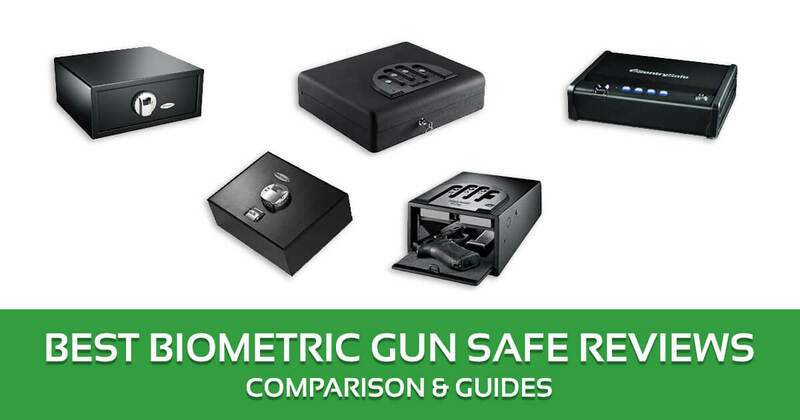 Biometric vs digital gun safe, which is better? A biometric safe is easier to use than a digital combination safe. While you could forget the combination lock in an emergency, it won’t be a problem with a biometric safe. How many fingerprints can be programmed in a biometric safe? Some biometric safes allow you to record up to 40 fingerprints or more. The number varies depending on the gun safe model, but the process is generally the same. What happens if the fingerprint scanner suddenly refuses to work? 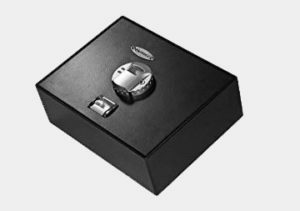 Biometric safes are bundled with an emergency key that allows you to open the safe if the system suddenly refuses to work. Having a biometric gun safe at home or in the car can spell the difference between life and death. You would want a biometric gun safe to be reliable all the time, so you can get hold of your guns and repel an attack. Furthermore, a good biometric gun safe is one that is strong and ply-resistant. You should also look for a biometric gun safe that is lightweight particularly if you are the type of gun owner who is always on the go. There are a lot of good biometric gun safes in the market, but the five aforementioned models are perhaps the best five today.